I have always been creative. Whether I am writing, doodling, or Mosaicing, I am always working on something. After I graduated from McDaniel College in 2011 with a BA in History I was done with the academic world. I wanted to do something creative. So, I turned my love of Color, Pattern, and Design into a hobby and now a career in Mosaics. 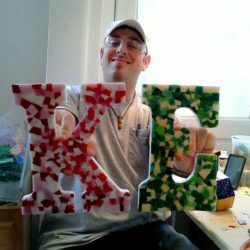 As a self-taught Mosaic Artist, I have done Mosaic Pieces ranging from large boards and boxes to letters and Picture Frames and everywhere in between. I do a lot of my work on commission. Whether I am working on a Mosaic for a Client or I am working on a Mosaic for the Gallery, I always seem to have a Project in front of me.